Apartment for 2-4 persons is located in a quiet and idyllic location Crikvenica. Only 20 meters from the sea !! Kitchen Description: Kitchen, dishes available, kitchen towels, electric cooker, hotplates: 2, refrigerator with freezer, coffee machine. Bedroom: double room with double bed, tiles. Bathroom / WC: bathroom with toilet, with bath. 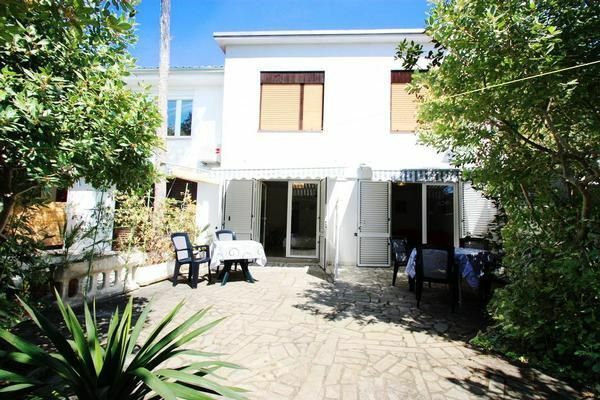 Balcony / Terrace: own terrace, patio seating available, parasols, patio size: 15 m². Distances: sea 20 m, sandy beach 600 m, fine gravel beach 20 m, pebble beach 20 m, rocky beach 60 m, concrete beach 40 m, center 1400 m, restaurant 90 m, supermarket 330 m, diving center 700 m, Disco 700 m busy road 70 m.
Booking fee: once per object Costs amounting to 25 EUR (Mandatory). Special features in the city Crikvenica restaurant, café, hairdresser, beauty salon, terrace for dancing, disco, souvenir shop, supermarket, shop, boutique, beauty center, tennis court, beach volleyball, water skiing, boat hire, motor boat rental, paddle boats and rowing boats, diving, bicycles, mopeds, bowling, table tennis, Car rental posible locally, Bicycle Rental, sun loungers and parasols, Casualty treatment, water slide for fee, Wellness Center.